Thanks to Mac Patterson for the photos and commentary on this episode. 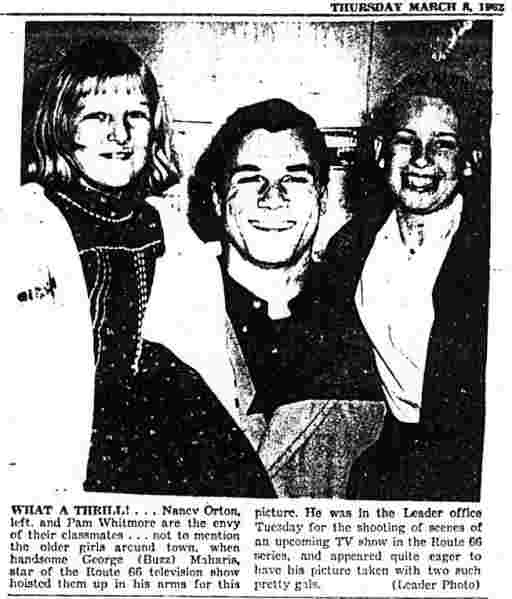 And more thanks to Mel Brown for the newspaper clippings. The bulk of Love Is A Skinny Kid was shot in Lewisville, Texas, Northwest of Dallas on Interstate 35. Two scenes were shot in the town of Seagoville Texas on the weekend of March 3 and 4, 1962. Seagoville is Southeast of Dallas on Highway 175. It is near the town of Crandall where the episode 1800 Days to Justice had been filmed the year before. One location was a small frame house on W. Farmers St. The second location is the Seagoville Elementary School at 306 N. Kaufman Street where interior classroom scenes were shot with Tuesday Weld. No exterior shots of the school were used in the finished episode. 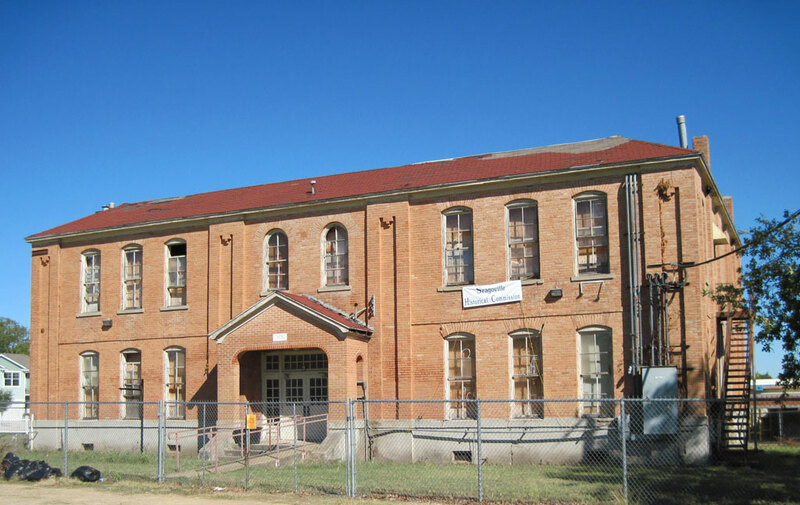 Currently, the building is in bad shape and is “Posted as an Unsafe Structure by the City of Seagoville.” There are efforts by the Seagoville Historical Society to save the building. 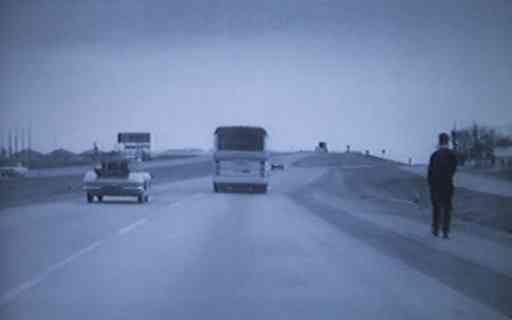 The opening shot of the Route 66 episode "Love Is A Skinny Kid" shows Tod and Buz in the Corvette, passing a bus on the highway. There is a fake sign saying the town of Kilkenny is three miles ahead. This episode was filmed in Lewisville, Texas which is just northwest of Dallas on Interstate 35E. This shot was made on Interstate 35E, going south toward Dallas, at the Valwood Parkway exit. 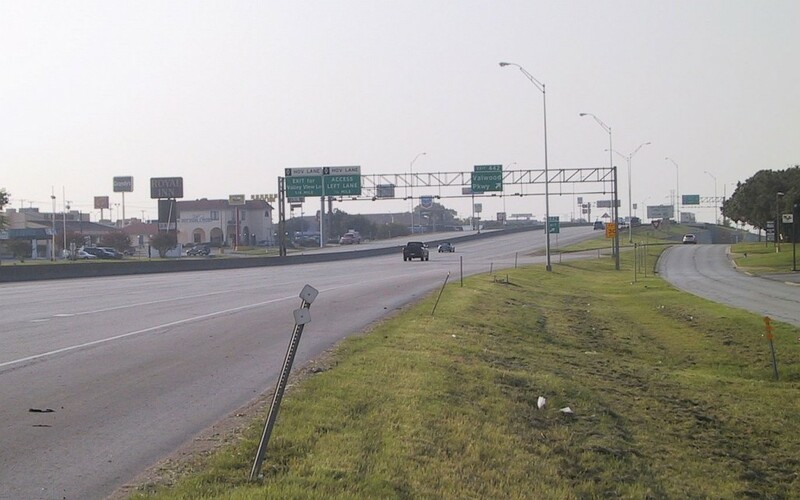 This exit is actually a few miles south of Lewisville. As the camera follows the Corvette you can see a sign indicating Valwood Parkway. Southbound is the only direction where the curve of the Interstate matches the original shot. Tod and Buz leave the Corvette at a gas station for a lube job and the station attendant tells them where they can get a bite to eat. 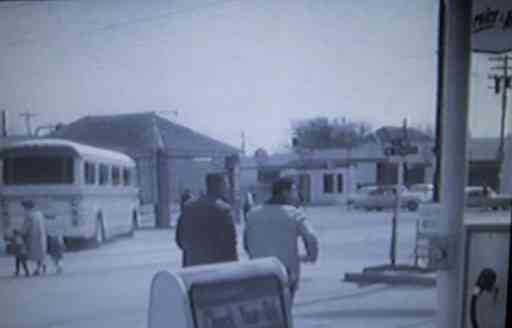 As they walk over to Main street, the bus they passed on the highway is just pulling into the Kilkenny Bus Depot. 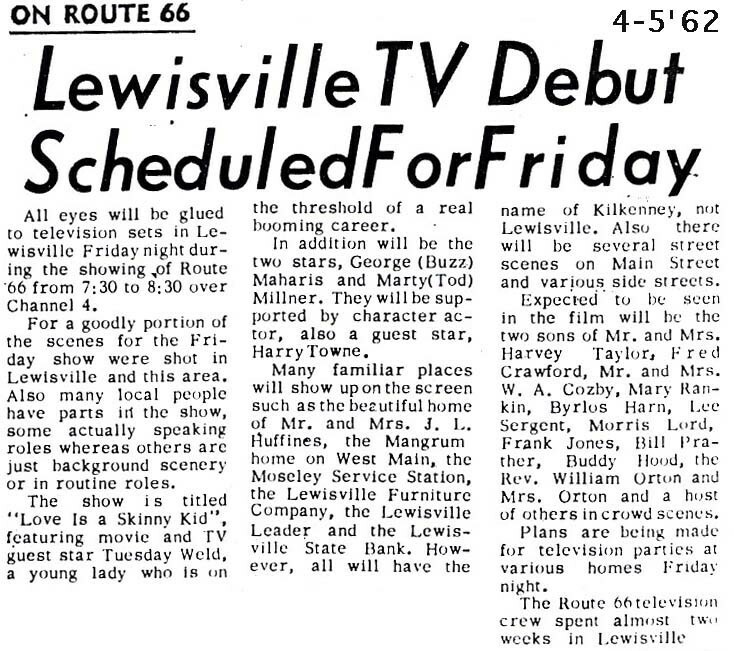 This episode was filmed in March, 1962 in Lewisville, Texas. 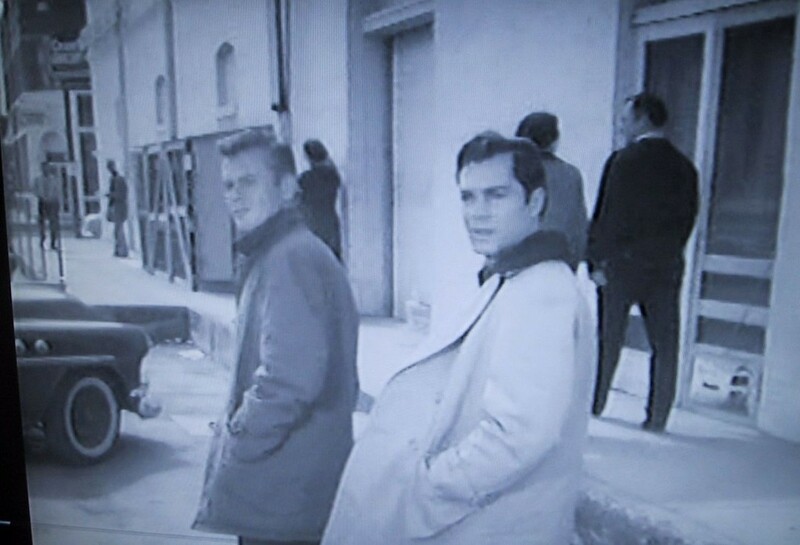 This sequence was shot at the intersection of Mill street and Church street. The building used as the bus depot is still there, though it has been remodeled and is currently an auto repair business. This shot was made from Church street looking southeast on Mill street toward Main. Google Earth Street View - Church St.
A crowd forms as a woman (Tuesday Weld) wearing a mask, steps off the bus. I don't know if the building was an actual bus depot at the time of this episode. Originally, it was one of those early gas stations which had the tall metal and glass gas pumps in front. The area under the roof has been enclosed into office space. The building looks shorter now, but that is because the roof line has been extended down and out in order to give the enclosed office an 8 ft. ceiling. 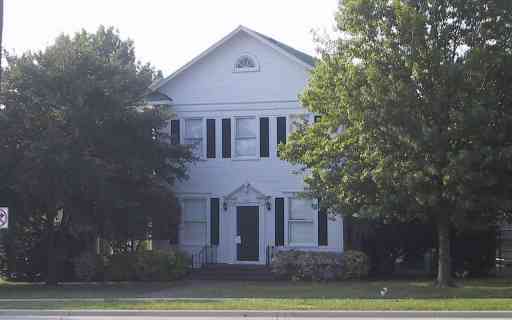 This building is on the SE corner of Church and Mill streets. As Tuesday Weld gets off the bus, she is confronted by a crowd of curious onlookers. This view is from the front of the bus depot looking West on Church Street. 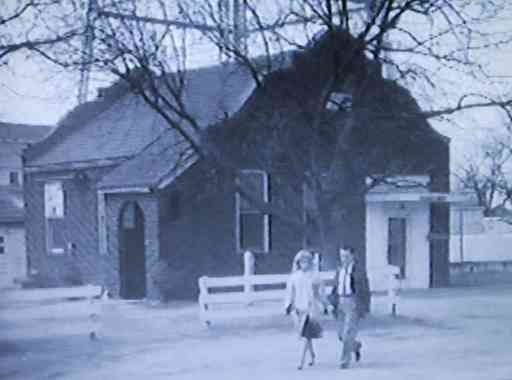 In both the screencap and the new photo I have placed an arrow pointing to the top of the Old Well House which is a Lewisville landmark. Finding this building is what made it possible to pin down this entire sequence. The service station where Tod and Buz left the Corvette would be to the extreme right of both pictures. 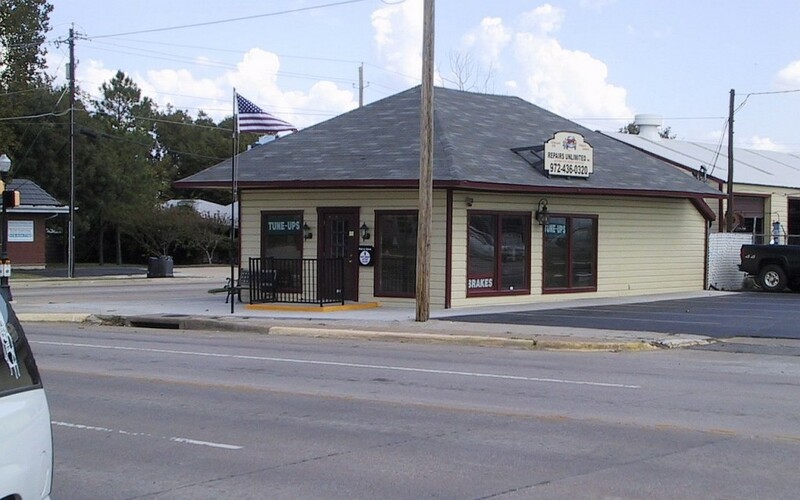 As you can see in the new photo, this entire side of Church Street has been taken over by a new Lewisville City Hall complex. Tod and Buz are about to turn the corner onto Main Street, when they are stopped in their tracks by all the commotion caused by Weld at the bus depot. This photo is looking South on Mill St. toward Main. This portion of downtown Lewisville is called "Old Town" and most of the buildings have been preserved and restored. 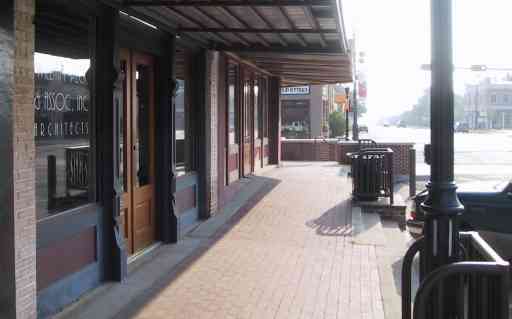 New brick sidewalks have been installed along with antique street lights. Tod and Buz are walking West on Main Street and watching Weld as she heads across the street to the newspaper office. Thanks to the restoration of this block, the view hasn't changed much. The door to Buz's right still has the same ornate carvings. They've just been painted green. The building directly behind the woman and little girl is still there too. Weld continues to create a sensation in Kilkenny by placing a doll on a stick in front of this house and then setting it on fire. The sheriff arrives to arrest Weld as Burt Reynolds looks on. The Mangrum house was originally located in the 500 block of W. Main in Lewisville, on the North side of the street, and at the time we visited Lewisville (October, 2008) it was thought to have been long since demolished to make way for the Northstar bank office that today stands in its place. In February, 2011 we were contacted by a Lewisville-area resident who had seen this photo - which was originally accompanied by a shot of the Northstar bank - and who told us that he believed the house had not been demolished but instead moved from its original location to whereabouts unknown. Armed with this information, a bit of detective work led us to its current location in the Austin Ranch development east of Lewisville and north of Dallas. Weld is brought to the Kilkenny Police Station for questioning. 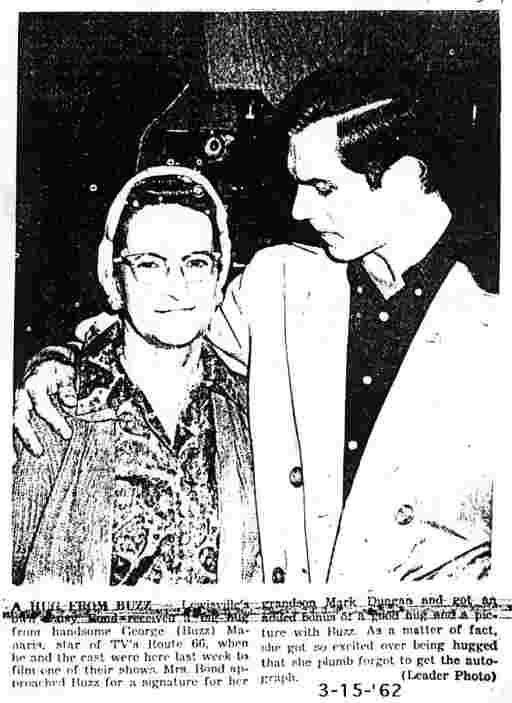 After it is determined that she has broken no laws, she and the newspaper editor played by the late Harry Townes leave. 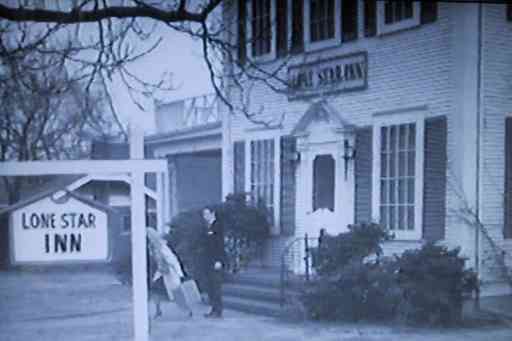 This building was used as the police station in this episode. It was originally known as the Old Well House because it was the site of the original water source for Lewisville. 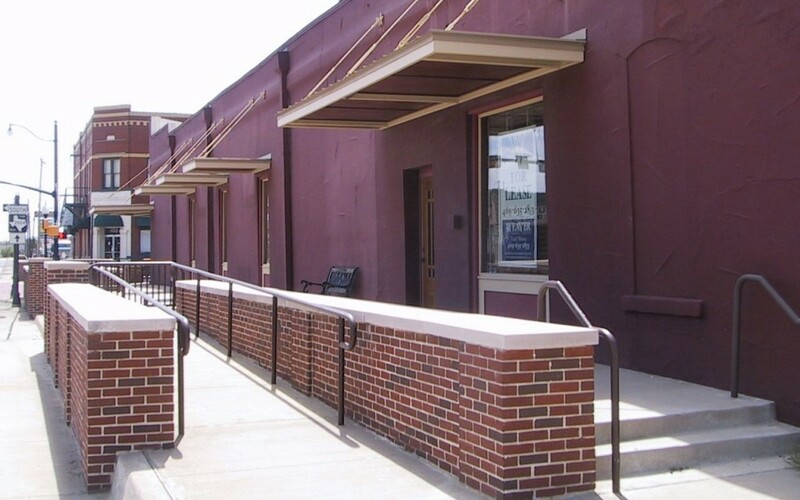 It has been used for many different purposes over the years, including police station. It had a jail cell at one time. 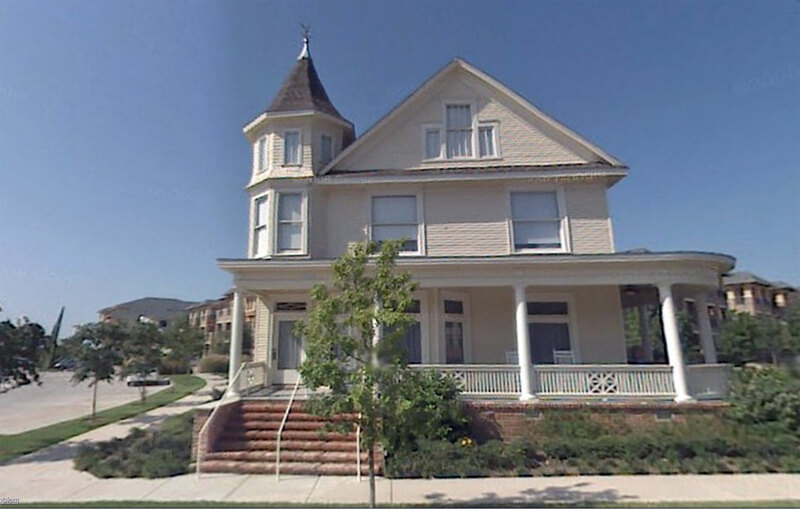 It has recently been fully restored to its 1927 appearance. Interestingly enough, this episode of Route 66 was used by the restoration architect to get an idea how it originally looked. 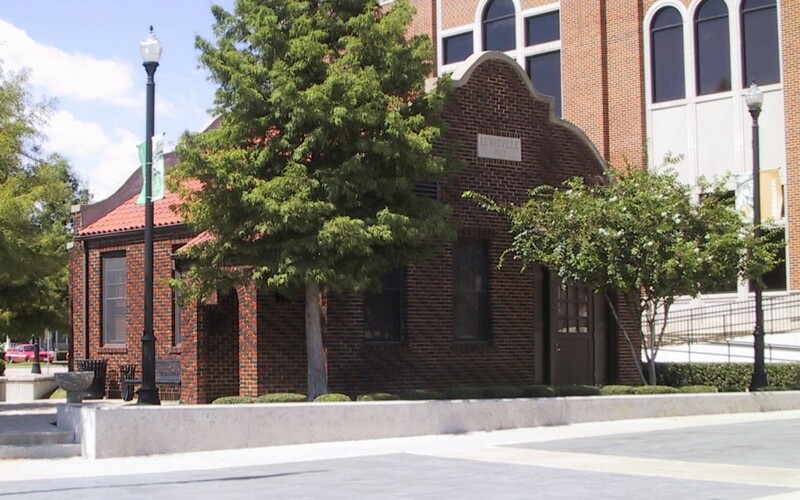 This fact is mentioned in a historical marker that is located next to the building. When the reason for Weld's visit to Kilkenny becomes known, she is kicked out of her rented room at the Lone Star Inn. The Lone Star Inn, was actually the home of Mr. and Mrs. J. L. Huffines of Lewisville before the Route 66 crew placed prop signs in the yard and above the door. But unlike the other frame houses in this episode, which have since been torn down, I did locate the site of this scene at 216 Main street in Lewisville. 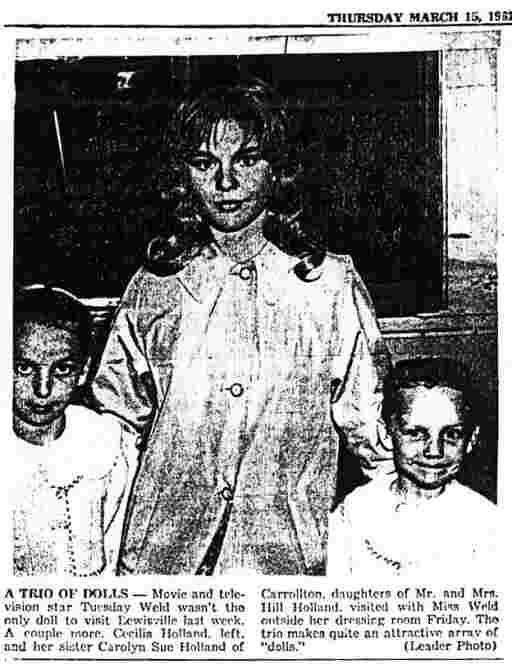 On her return to Kilkenny, the adult Miriam, played by Tuesday Weld, visits her childhood home. She talks to a woman who is planting something in the yard, but she doesn't know who the previous owners were. 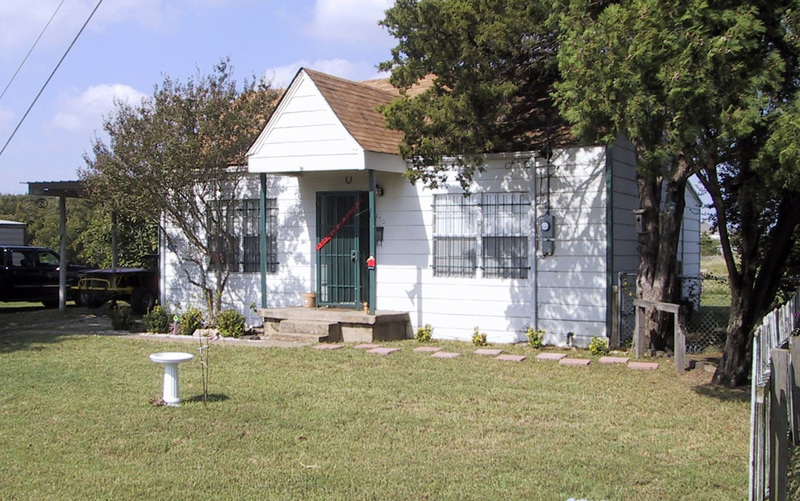 This house is actually located in the town of Seagoville which is SE of Dallas on Highway 175. 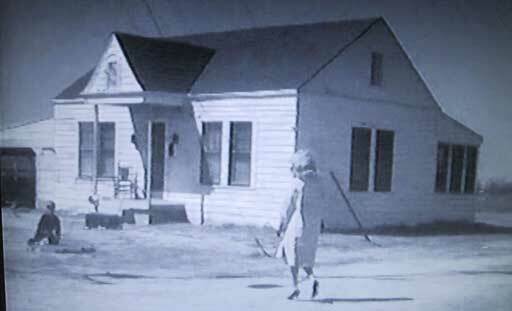 The house is located at 402 W Farmers Rd.. With the exception of the trees, the house itself hasn't changed much. And someone is still trying to get something to grow in the center of the front yard just like in 1962. Google Earth Street View - 402 W Farmers Rd. Tuesday Weld as Meriam Moore continues to search for answers to her past in the town of Kilkenny. She visits the local cemetery and discovers two grave markers that confirm what she had suspected. 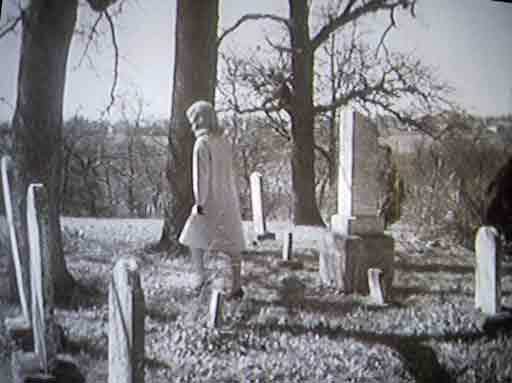 This scene was filmed at the Smith Cemetery in Lewisville, Texas. It is located at the end of Smith Street not far from the Church Street locations. A Texas Historical Commission marker explains that the land was donated by the Thomas Morgan Smith family in 1861 for use as a cemetery. 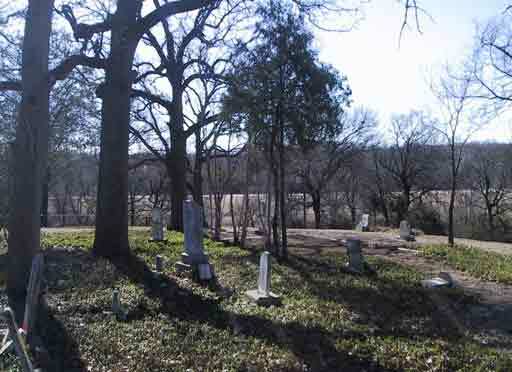 There are over 400 marked graves and is still in use by the community. 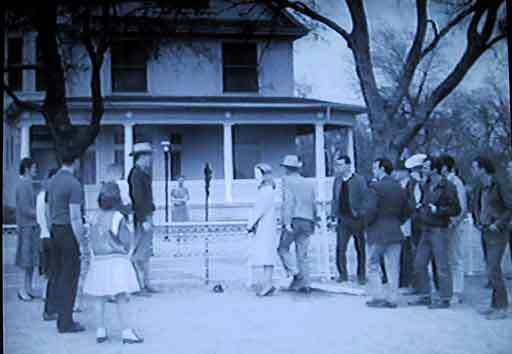 Lewisville Used As Site For Filming Of Route 66. Just about everybody got into the act when the television show, Route 66, shot its forthcoming show "Love Is a Skinny Kid" in Lewisville starting last Friday, and ending... maybe, today. Nancy Orton, left, and Pam Whitmore are the envy of their classmates... not to mention the older girls around town, when handsome George (Buzz) Maharis, star of the "Route 66" television show hoisted them up in his arms for this picture. He was in the Leader office Tuesday for the shooting of the scenes of an upcoming TV show in the Route 66 series, and appeared quite eager to have his picture taken with two such pretty girls. Lewisville's own Patsy Bond received a big hug from handsome George (Buzz) Maharis, star of TV's Route 66, when he and the cast were here last week to film one of their shows. Mrs. Bond approached Buzz for a signature for her grandson Mark Dungan and got an added bonus of a good hug and a picture with Buzz. As a matter of fact, she got so excited over being hugged that she plumb forgot to get the autograph. Marty Milner, left, star of Route 66, while shooting a street scene in front of the Lewisville Leader last week, paused to visit with Bonnie Cobb, Lewisville High School senior, and Bill Wolters, freshman at North Texas State University. Apparently Bonnie, who was student assistant in directing the recent LHS smash hit senior play, is giving Marty a few pointers on how it should be done. That's what Martin Sisk is saying about the two signs on the Leader's front window. 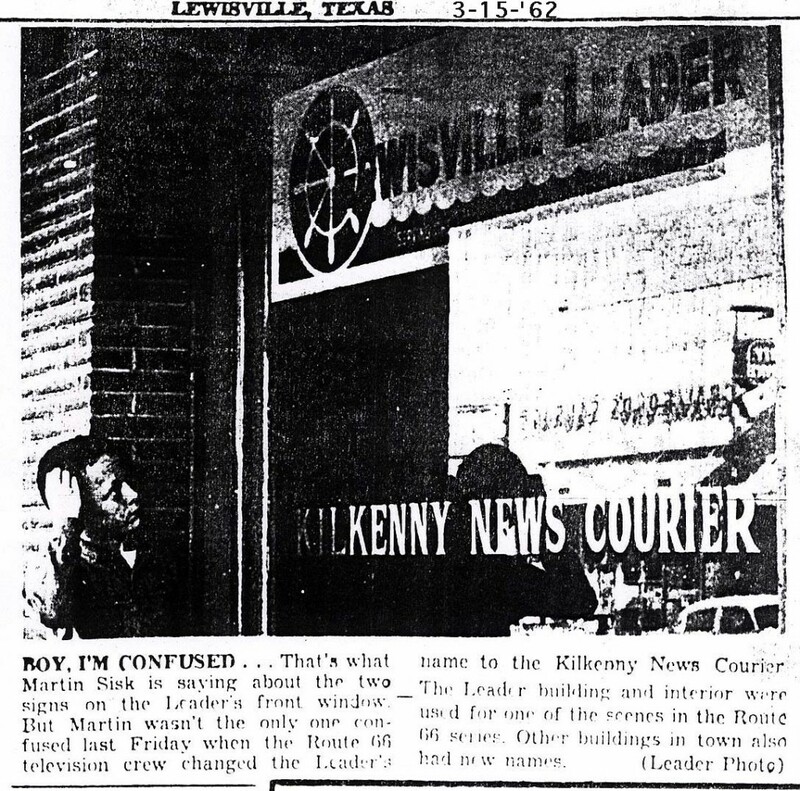 But Martin wasn't the only one confused last Friday when the Route 66 television crew changed the Leader's name to the Kilkenny News Courier. The Leader building and interior were used for one of the scenes in the Route 66 series. Other buildings in town also had new names. 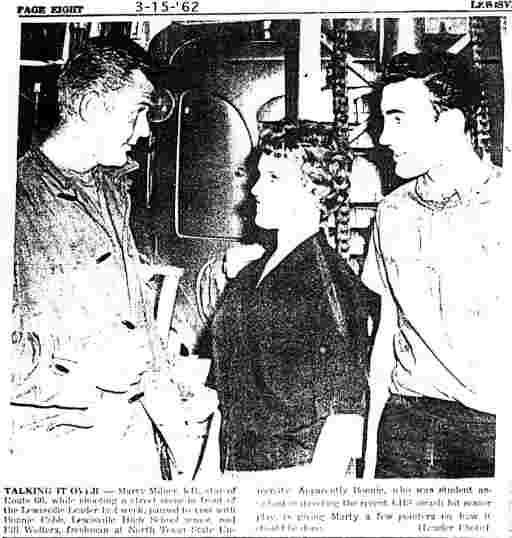 Movie and television star Tuesday Weld wasn't the only doll to visit Lewisville last week. A couple more. Cecilia Holland, left, and her sister Carolyn Sue Holland of Carrollton, daughters of Mr. and Mrs. Hill Holland visited with Miss Weld outside her dressing room Friday. The trio makes quite an attractive array of "dolls." From The Community Public Service Monthly Magazine, The Communicator. 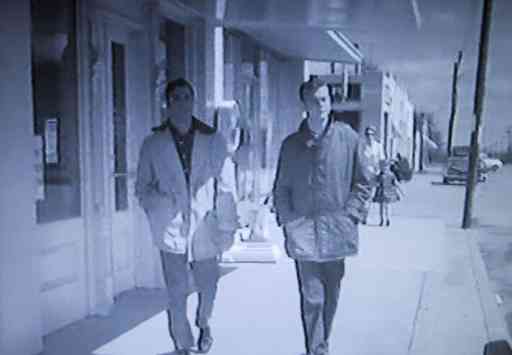 All eyes will be glued to television sets in Lewisville Friday night during the showing of Route 66 from 7:30 to 8:30 over Channel 4. 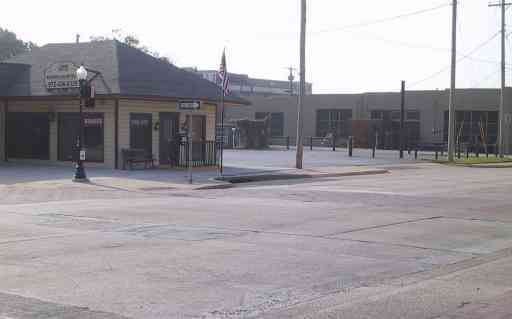 For a goodly portion of the scenes for the Friday show were shot in Lewisville and this area. Also many local people have parts in the show, some actually speaking roles whereas others are just background scenery or in routine roles. 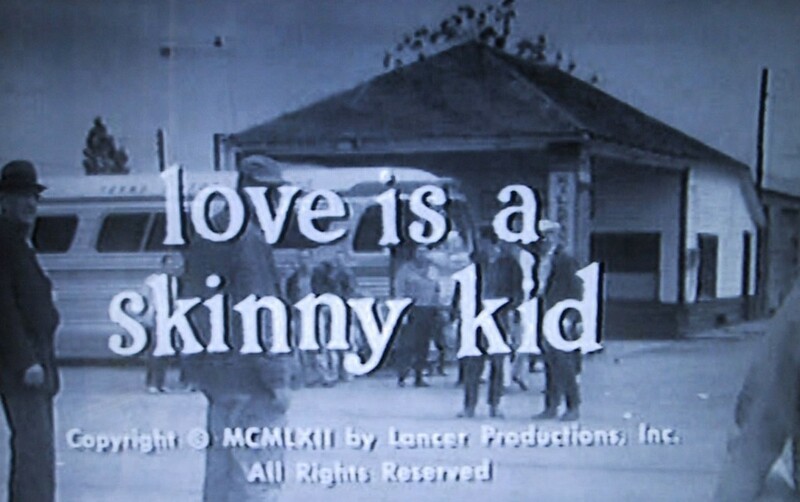 The show is titled "Love Is a Skinny Kid", featuring movie and TV guest star Tuesday Weld, a young lady who is on the threshold of a real booming career. In addition will be the two stars, George (Buzz) Maharis and Marty (Tod) Milner. They will be supported by character actor, also a guest star, Harry Towne. 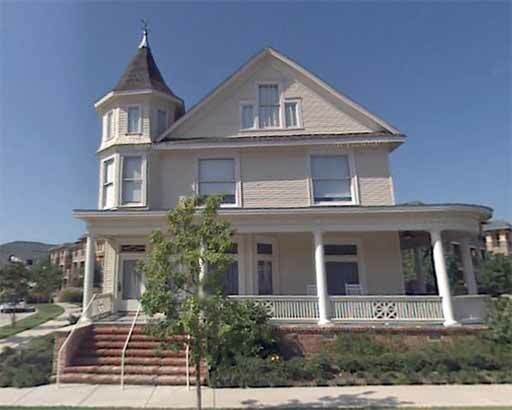 Many familiar places will be shown up on the screen such as the beautiful home of Mr. and Mrs. J.L. 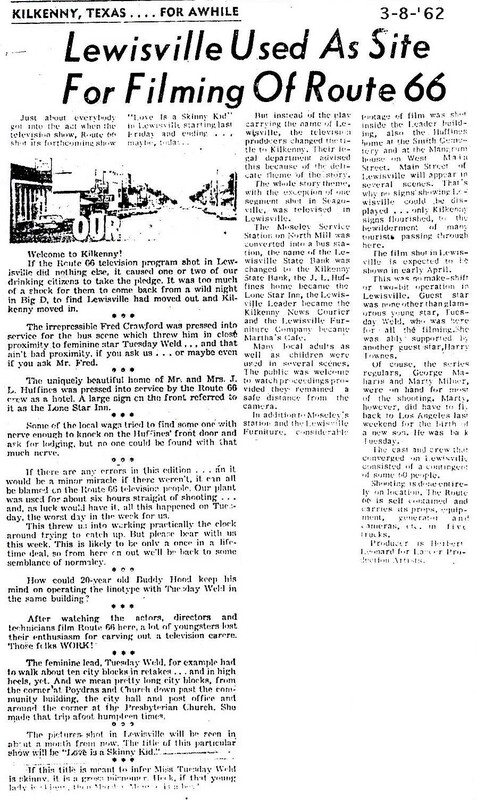 Huffines, the Mangrum home on West Main, the Moseley Service Station, the Lewisville Furniture Company, the Lewisville Leader and the Lewisville State Bank. However, all will have the name of Kilkenney (sic), not Lewisville. Also there will be several scenes on Main Street and various side streets. Expected to be seen in the film will be the two sons of Mr. and Mrs. Harvey Taylor, Fred Crawford, Mr. and Mrs. W. A. Cozby, Mary Rankin, Byrlos Harn, Lee Sergent, Morris Lord, Frank Jones, Bill Prather, Buddy Hood, the Rev. William Orton and a host of others in crowd scenes. Plans are being made for television parties at various homes Friday night. 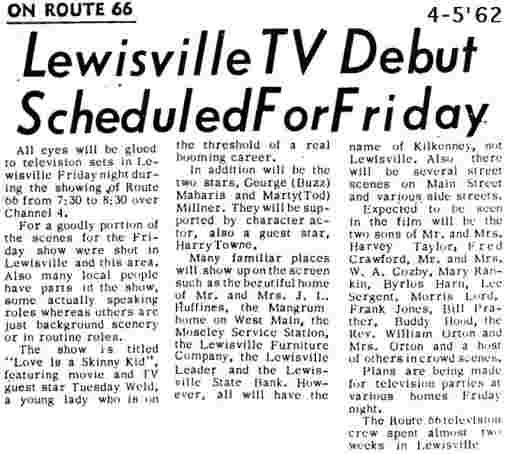 The Route 66 television crew spent almost two weeks in Lewisville.